The Frognot community was located east of Blue Ridge. It had a store and a school. 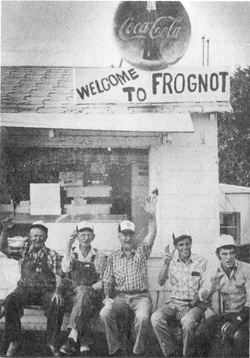 The Frognot water district still survives. The name is also spelled Frog Not. There are several theories as to where the name came from. One is that the area had an abundance of frogs. They killed the frogs and became known as Frognot. Another theory is that the boys brought frogs to school. The school adopted a no frog policy. Some people say the name is actually Frog Nod because the frogs are singing when they nod off to sleep.